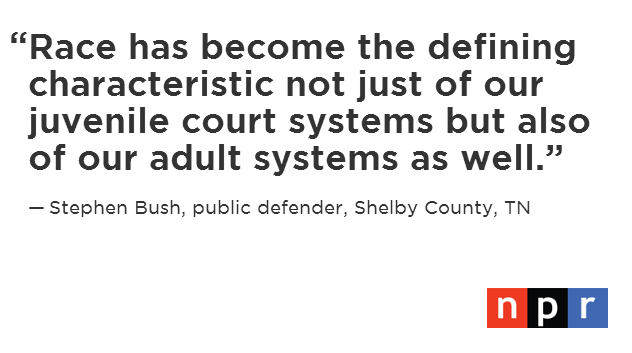 It’s a long game — the reform of the Shelby County Juvenile Court. As this recent story on NPR’s Morning Edition illustrates so well, there is still a very long way to go. Whether you’ve been keeping up with the stories about Shelby County Juvenile Court reform or not, this piece by NPR provides a good overview of changes that have taken place since a scathing investigation by the Department of Justice’s Civil Rights Division was released in 2012. The report claimed that Shelby County’s Juvenile Court has been responsible for systemic violation of due process rights for children. Perhaps more damaging, the DOJ conducted a detailed analysis of five years of court data that showed the court treated black children more harshly than white children. This disparity was most stark in cases where children were facing transfer to the adult system. In the 2013 Memorandum of Agreement between the DOJ, Shelby County and the Juvenile Court, the Shelby County Public Defender’s Office was tapped to oversee the transformation of the juvenile defender function. This marked the first time the Public Defender had been directly responsible for defending children in forty years. The office’s newly formed Juvenile Defender Unit began taking cases at the start of 2014. By late August or early September, the office will open a stand-alone juvenile defender center next to the court. The new center, renovated carefully with the needs of children and their families in mind, will provide a safe and welcoming environment for this new, difficult and highly-specialized advocacy. You can listen to the story here. Or read the transcript here, although we highly recommend the audio version. The full DOJ report and the 2013 Memorandum of Agreement are available here.